Comm Eye Health Vol. 18 No. 55 2005 pp 106 - 108. Published online 01 October 2005. Eye injuries occur without any warning. One moment a person can have perfectly normal eyes, and the next moment he or she may be blind or at least in severe pain. Therefore we should be eternally vigilant and aware of situations that could lead to injury. Eye injuries may be trivial or serious. All precautions should be taken to avoid injury. Repair of a grave injury is almost impossible, and prevention is most certainly better than cure. The role of health education is to promote awareness amongst the public about how to protect their eyes, and what to do in the case of injury. Educate all children starting from pre-school age about objects, events and actions that can cause eye injuries. Educate the mother – the first health provider in the home. Create awareness regarding eye injuries at the interpersonal level, for example in one-to-one situations, never missing an opportunity to teach people about potential dangers to the eyes and what to do in case of an injury. Create awareness regarding eye injuries at the group level, for example, amongst groups sharing a common occupation or activity such as welders, football players, cyclists and industrial workers. 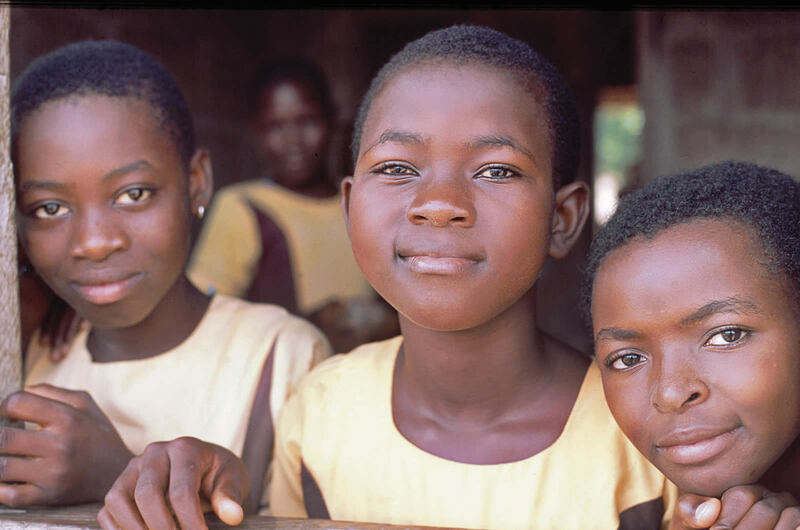 At group level one might channel messages through community health workers, teachers, sports coaches, volunteers and journalists, who themselves will need to be educated. Create awareness regarding eye injuries amongst the general public through appropriate mass media such as print (e.g. newspapers), electronic media (e.g. radio and TV) and non-electronic media (e.g. street theatre, puppet shows). Advocate amongst leaders and policy makers to introduce and enforce policies which will help prevent blindness from injuries, for example, legislation for health and safety at work, the wearing of car seat belts, the banning of explosive fire crackers, etc. Advocate on a global level on issues such as banning anti-personnel mines. From the educational point of view, we analyse the types of human situations or activities that put people at risk of blindness from eye injury. The list can be extensive and will vary from place to place. As a first step, it is useful to think through risks of different types of injuries in your own context. particles from a high speed grinder. when using a hammer on a cold chisel. Wear protective eyewear in all the above situations. Children should not stick their heads out of the window of a moving vehicle. shootings resulting in multiple shrapnel injuries. Discourage the purchase and use of firecrackers in the home. Dispose of firecrackers by soaking them in water and then putting them in the rubbish bin. Don’t let children or teenagers light explosive firecrackers. Protective clothing for those working with explosives. playing with bow and arrows, for example, when imitating television heroes. Parents and children should avoid situations that might lead to sharp objects damaging the eyes. Don’t let children play with sharp objects. Manufacturers of toys should ensure that toys are as safe as possible. Employers should ensure at-risk workers are informed and provided with appropriate eye protection. Do not remove anything that is stuck in the eye; cover with a paper cup or other clean object and get help. Don’t leave boiling saucepans on reachable surfaces. Switch off irons or leave on a wall-mounted cradle out of reach of children. These often burn both eyes and parts of the face. Burnt eyelid skin scars, contracts and leads to severe exposure keratitis and loss of the eye. many household cleaning substances containing acids and alkalis, fungicides, weed killers and pesticides. 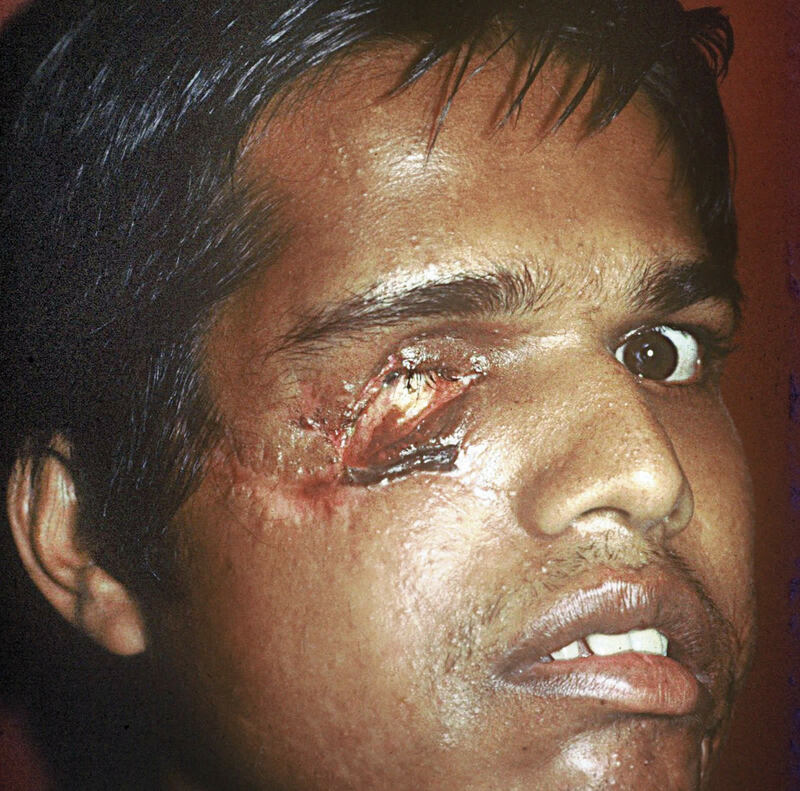 acid thrown at a face by an assailant. Keep all weed killers, pesticides, fungicides, acids and alcohol under lock and key. Wear protective eyewear and clothing in high-risk industrial situations. Create and enforce laws to punish acid throwers. If a chemical splashes in the eye, immediately irrigate the eye with water and get help (page 109 for instuctions on how to irrigate the eye). gazing at UV light sources. All welders to wear protective shields. Wear dark glasses with UV filters when exposed to bright UV light. A self-induced cause of blindness is an eclipse burn. Solar eclipses should not be watched. However, if one needs to watch it, use special eclipse viewers or exposed camera film. If not, the most central areas of the eyes, the maculae, would be burnt by the sun. Teach children to be careful in the way they play with balls. Warn children about the dangers of rough games. Encourage sports men and women to wear protective eyewear when playing high-risk sports such as squash. lamp hooks hung from a rafter would tear off the entire upper lid when children in a group run around the house. adults suffer similar injuries when mauled by a bear or are gored by a bull. Adults should take adequate care to see that no hooks and nails are left fixed at a low level. Supervise children when they are playing with animals. Don’t lose the sight of our children! Eye injuries are largely preventable and occur mostly in the younger age groups. 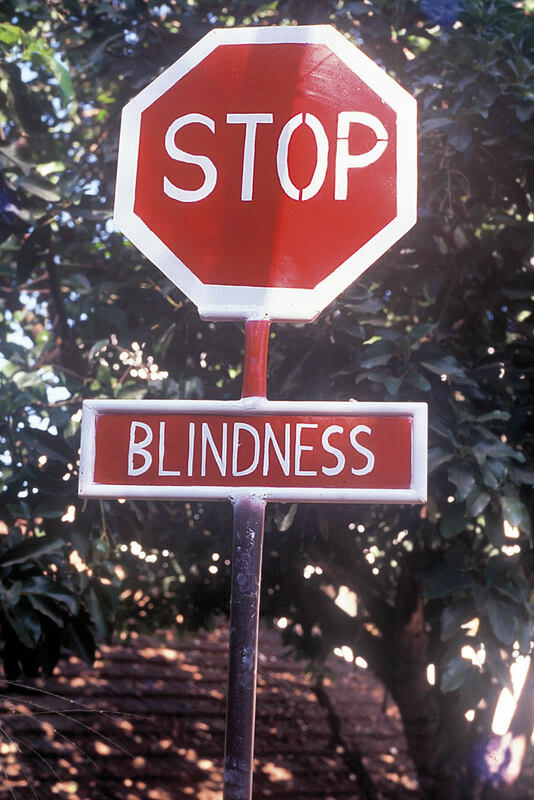 The key intervention for preventing blindness from injuries is through health promotion. Eye care workers need to collaborate with teachers, media professionals and health educators to inform the public. They also need to influence policy makers and leaders to minimise the public’s exposure to risks: potentially dangerous household and industrial products should be appropriately packaged and labelled; the wearing of protective eyewear should be promoted in hazardous situations and legally enforced if necessary; and children’s toys and environments should be scrutinised for potential dangers to their eyes. Since accidents will happen, education should include the message that eye injuries should be treated as a medical emergency and patients should seek help immediately. First aid at home should only be attempted if chemicals have splashed in the eye, but in all other cases, health education should warn people of the dangers of trying to treat eye injuries themselves. 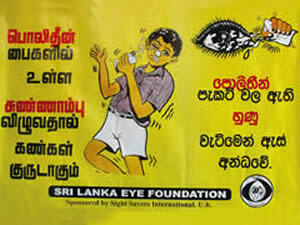 The Sri Lanka Eye Foundation has been working to prevent ocular injuries since 1982. At this time, over 400 ocular injuries were seen around the festival times of Sinhala and Tamil New Year (mid April) and Christmas. All were due to firecracker injuries. To address this problem, an eight-minute drama was produced and aired on primetime national radio. A slot on post-primetime national TV used the format of a panel discussion between two members of our organisation and the interviewer, based on a screening of slides of injuries from the previous year. Additionally, cartoon posters were painted on aluminium sheets 4ft by 2ft and riveted on the back and side of long distance intercity coaches. The same posters are still being printed on paper in print runs of 1,000 each year. The set of seven posters are distributed free to schools, displayed in public places, and issued to every primary health care worker trained (Sri Lanka has approximately 6,000 PHC workers), trainee volunteers, journalists, factory workers and teachers. Another target for health promotion was to prevent eye injuries from lime burns. In Sri Lanka, a mixture of calcium oxide and hydroxide (slaked lime) is packaged in a small polythene bag. The package is about two inches by one inch. Children play with these packets, blowing into them and causing the lime to enter the eye. The eye appears almost normal just after the accident but progressively blood vessels invade the cornea. Health promotion interventions to win the battle against calcium burns included advising the public not to purchase the lime pack or, if they did purchase it, to cut open one entire side and squeeze the lime onto a container such as a saucer or betel leaf. Attempts to address the problem at source were less successful: dealers did not follow advice to avoid packing the mixture in polythene bags, and a request to the Department of Small Industries to ban the small packet was not supported. However, thanks to sustained health education efforts, we hardly see children with lime burns nowadays. The Healthy Eyes Activity Book (see useful resources page 116) was based on research conducted with rural school children in three African countries using the Draw and Write technique, whereby children’s views and experiences are solicited. Many of the children cited accidents as a cause of eye problems and a selection of the illustrated stories were used to develop this health education book. The idea was to make an activity book which would tell stories in the children’s own words, and then encourage the readers to think about the potential dangers which may occur in their own activities and environments. Each story is followed by information on what to do about different types of eye injuries.